I don't usually make things on request (non-crafters assume we whip up yarn projects in minutes, if only!) but this particular sweet teen spotted this on my Pinterest board and her mom is a very close friend who offered to pay me for it (naturally I will make it gratis!). 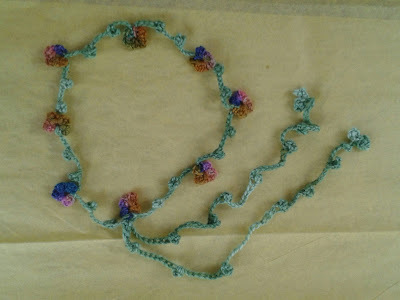 The pattern is from www.redheart.com entitled Elegant Floral Headband. Of course I dug into my stash and didn't have the thread that was called for so using a thicker yarn had to reduce the number of chains, size of leaves and substitute a 2 single crochet cluster for a 3 double crochet cluster for the flowers to keep the scale similar. My ten year old approves and has predictably requested one too!